The queen and saviour of the music industry, BeyoncÃ© Knowles Carter, and her husband, rapper Jay Z, have announced a part two of their high-grossing, wallet-snatching On The Run Tour. Why should the rest of us care? Well, we are speculating that the OTR II might be coming to Africa, and before you say we are reaching before stretching, hear our reasons out. Remember when BeyoncÃ© had a Nigerian themed baby shower when she was still pregnant with her twins, Rumi and Sir Carter last year? This was also Beyâ€™s way of announcing that she would be naming one of her twins after an Indian poet too. That could have been interpreted as cultural appropriation but we all know BeyoncÃ© is queen of signs and symbolism and maybe this could possibly have been a sign that maybe she was coming to Africa. Remember that deleted tweet by SABC radio station, Metro FM, back in December last year that BeyoncÃ© is coming to South Africa in October 2018? Yep, although the tweet was deleted from the account, it sure sparked a hella lot of excitement with the South African Beyhive. Although Metro FM didn’t tweet anything after deleting that tweet, we surely do believe they might have heard a word or two. Okay, surely one plus one should add up to two here. Firstly Metro FM tweeted this in December 2017, when NO ONE had any knowledge of the Carters planning a tour, and the last tour date in North America is on 2 October and then Metro tweeted that the Queen will be coming to SA? We donâ€™t know about y’all but this sounds too fishy and could possibly mean something. The 2014 OTR only included dates between North America and France, however, the 2018 tour dates (which we are not entirely sure are complete) have now included the United Kingdom. This could mean that BeyoncÃ© is yet to add more tour dates and places, and we have a feeling Africa is somewhere on that coming list. The OTR II artwork posted by Beyonce on her Instagram page could also mean that this time, she is could come pop by in Africa. 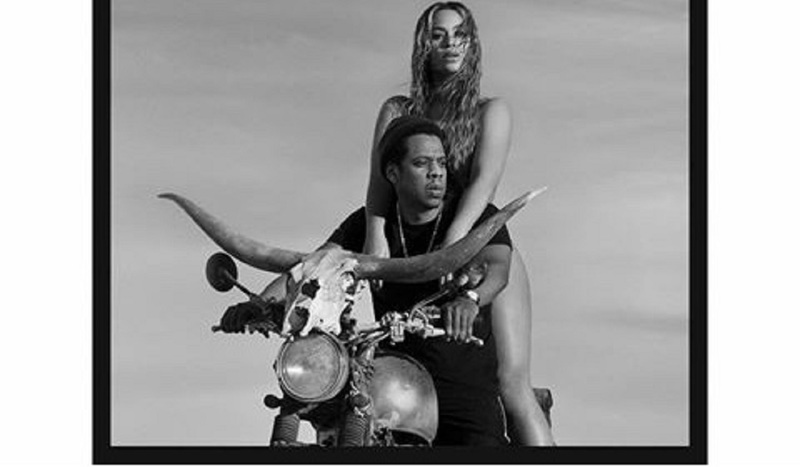 The artwork image starring BeyoncÃ© and her husband on a motorbike with a skull on top of it was inspired by a Senegalese film from the 1970s called Touki Bouki. Maybe the queen is trying to tell us that she is really might be coming to visit us. To all of those who only joined the Beyhive recently and were not familiar with then young BeyoncÃ©, the Queen has performed in South Africa before. Yep, back in 2003, at the Nelson Mandela 46664 HIV/AIDS campaign. Surely she misses the welcoming she received and might consider coming back. Who knows? We all know that BeyoncÃ© is queen of surprises when we least expect it. Like when she dropped tour dates for her Formation World Tour months before dropping her Lemonade album, and when she added more tour dates while on tour. So who knows, maybe the Carters might add more tour dates before or during their tour. All we can say is, yâ€™all better start opening BeyoncÃ© investment accounts because you never know. One day we might be sleeping and wake up to (South) Africa added on the tour list.